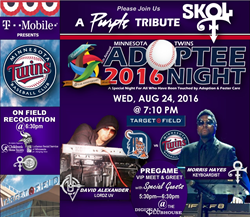 In celebration of its 5 Year Anniversary, Mixed Roots Foundation will go back to their Minnesota roots and present its 4th Annual ‘Adoptee Night’ with the MN Twins in partnership with T-Mobile this year as they take on the Detroit Tigers on Wednesday, August 24, 2016 at 7:10 p.m. at Target Field. T-Mobile will sponsor 200 kids to assist with helping Mixed Roots Foundation reach its goal of sending 1,500 adopted and foster care kids to the game along with providing purple rally towels that will be given to each Adoptee Night attendee as a tribute to the late Prince and the MN Vikings. Mixed Roots Foundation will not only pay a purple tribute to Prince and the MN Vikings for their work in the community, but they will also celebrate and recognize two organizations on the field that Prince and the MN Vikings have also supported including Children’s Home Society of Minnesota (CH) / Lutheran Social Services of MN (LSS) and Harvest Network of Schools. Along with T-Mobile as the presenting sponsor and on field honorees, Mixed Roots Foundation has also teamed up with BLIND, Inc., MN Department of Children and Family Services (DCFS) / MN ADOPT, Connections to Independence (C2i), Adopted Koreans (AK) Connection of MN, Pillsbury United Communities, Kindred Foundation for Adoption, Seven Steakhouse Sushi Ultralounge Skybar, KMOJ 89.9 Radio, Lordz Uv, and several other individuals, businesses and organizations to help recruit adoptees, foster youth and their families to participate in the special event which will also include a 7th Inning Stretch Sing along. Mixed Roots Foundation will also host a pregame VIP Meet & Greet reception in the Twins Digital Clubhouse at Target Field at 5:30 p.m. where fans will have the opportunity to meet and network with members of the MN Vikings as well as some former members of Prince’s New Power Generation Band including keyboardist/musical director, Morris Hayes, David Alexander, co-founder of Icon Collective Production School / creators of Lordz Uv, and other special VIP guests. Adoptee Night ticket holders will be seated in an exclusive Adoptee Night section where everyone is encouraged to wear purple attire to match the purple theme. General Tickets cost $25. To become a community partner or event sponsor, please contact 213.725.8054 or email sponsor(at)mixedrootsfoundation(dot)org. To donate or sponsor kids, visit crowdrise.com/mntwinsadopteenight2016. To volunteer or learn more about the event, please visit http://www.mixedrootsfoundation.org for more information. A portion of ticket sales will also benefit the Dr. Joseph L. White Pioneering the Way Mentoring Scholarship. With his role in the music business as a professional player and producer for more than 25 years, Morris Hayes currently is the Founder and CEO of Ill Street Productions, a music production company that has written for various film & television shows including, Flava Flav - "Under One Roof", Martin Lawrence - "You So Crazy" & HBO - "Laurel Avenue". Morris has also appeared on albums and worked very closely with Prince, Maceo Parker, The Time, Martika, George Clinton, Mazarati, Bria Valente & many others. Morris operates a recording studio, The Underground Lab, in L.A.. Morris is now producing various new artist projects and is currently involved with the film & television industries writing original scores, source material & trailer music. Morris specializes in Keyboard playing/drum programming, song writing, arranging, music production & music director of bands. To keep up with what Morris is working on, please visit: http://www.facebook.com/morrishayesmusic. Along with acting as President, Maureen Warren oversees the following lines of service offered by LSS: behavioral health and financial counseling, youth services, refugee services, housing and development services and operations of the Center for Changing Lives in Minneapolis. Previously, she served as Vice President of Special Projects for the organization. Maureen earned her Juris Doctor at the University of Minnesota Law School and her Bachelor of Arts degree at the College of Saint Catherine in St. Paul, MN. She currently serves as Chair of the Board of the Twin Cities Family Housing Fund and has served on numerous nonprofit boards focused on creating healthy, sustainable communities and opportunities for low and moderate income families and individuals. She currently lives in St. Paul with her son, Samuel, whom she adopted from Vinh Long, Vietnam in January of 2002 with the support of the Children’s Home Society. To learn more about Maureen and see what she and CHS/LSS are working on, please visit: https://chlss.org/about-us/leadership. Eric Mahmoud has more than 20 years of hands-on experience in educational administration. His commitment to academic excellence is reflected in his passionate pursuit of policies and programs that support teachers, empower parents, and inspire students. He believes, fundamentally, that all children deserve, and must receive, a high-quality education. Mr. Mahmoud is Founder and CEO of Seed Academy, Harvest Preparatory School, Best Academy, Sister Academy and Mastery Schools. At Harvest Preparatory and Best Academy, he is responsible for fundraising, financial management, public relations, organizational accountability, facility management, and management of state compliance and accountability. Under his leadership Harvest Preparatory and Best Academy are the top schools in the state of Minnesota in closing the academic achievement gap between white and African American children. In 2011 and 2012, Best Academy all-boys 3rd through 8th grade program closed the achievement gap by outperforming the state white student average in reading and math. In October 2012, the Minnesota Business Partnership recognized Harvest and Best Academy with its Minnesota Futures Award. This award is given to the top two schools in the state of Minnesota. Eric Mahmoud has been married to Dr. Ella Mahmoud for over 30 years, and they have four children. He is a graduate of the University of Wisconsin-Madison with a Bachelor of Science degree in Electrical and Computer Engineering. To learn more about Eric and the Harvest Network Schools, please visit: http://www.harvestnetworkofschools.org. As America's Un-carrier, T-Mobile US, Inc. (NASDAQ: TMUS) is redefining the way consumers and businesses buy wireless services through leading product and service innovation. T-Mobile’s advanced nationwide 4G LTE network delivers outstanding wireless experiences to more than 65.5 million customers who are unwilling to compromise on quality and value. Based in Bellevue, Washington, T-Mobile US provides services through its subsidiaries and operates its flagship brands, T-Mobile and MetroPCS. To learn more about T-Mobile and its products and services, please visit: http://www.t-mobile.com. As the fight song goes: “V-I-K-I-N-G-S, Skol Vikings, Let’s Go!” For the past 47 years, the Minnesota Vikings, the Men in Purple have always been near the top of the division standings. Only four NFL teams have played in more Super Bowls, and one the Dallas Cowboys, have more playoff appearances. The Vikings were in Super Bowls IV, VIII, IX, and XI. In 1986, Fran Tarkenton became the first Vikings player to be inducted into the Pro Football Hall of Fame in Canton, Ohio. From Ahmad Rashad to Cris Carter, from Jim Marshall to Randall McDaniel and from Matt Blair to John Randle, the Vikings have been among the most exciting teams to watch. This year in 2016, the MN Vikings will celebrate their new home at the U.S. Bank Stadium that will officially open for the NFL 2016 season in August. To check out the 2016 MN Vikings Football schedule, please visit: http://www.vikings.com. Founded in 1889, Children’s Home Society of Minnesota and Luther Social Service of Minnesota works to give every children security, opportunity, and a loving family. On July 1, 2012, Children’s Home Society and Lutheran Social Service of Minnesota came together in partnership to combine complementary adoption services and provide high standards of quality and strength as a national provider of adoption services. For more info, please visit: http://www.chlss.org. Harvest Network of Schools serves grades K-4 and was established in 1992 from the dual visions of Dr. Ella Gates Mahmoud and Eric Mahmoud - following the success of SEED Daycare. Beginning as a private, nonprofit elementary school under the SEED Daycare, Inc., Harvest Prep became a public charter school in 1998. Since its establishment in 1992, we have grown from 24 students to over 400 students, with an annual waiting list. In 2015, Harvest Prep moved their middle school scholars to a second campus, expanding the reach and impact of the Harvest Network of Schools throughout north Minneapolis. The mission is to instruct, empower, enable, and guide children to achieve superior academic, social, and moral development and for every child to be college and career ready. To learn more, please visit: http://www.harvestnetworkofschools.org. Mixed Roots Foundation is a 501(c)(3) nonprofit organization based in Los Angeles, CA with presence also in San Francisco and Minneapolis. Mixed Roots Foundation serves as the first and only national / global multicultural foundation for adoptees and their families representative of the international, domestic, and foster care adoption experience that leverages philanthropy and grassroots fundraising to support important post-adoption resources for adoptees and their families including mentoring, DNA testing and unique scholarships/grants for the adoption and foster care community. For more info, visit http://www.mixedrootsfoundation.org, LIKE Mixed Roots Foundation on Facebook or Follow on Twitter and Instagram @mixedroots.